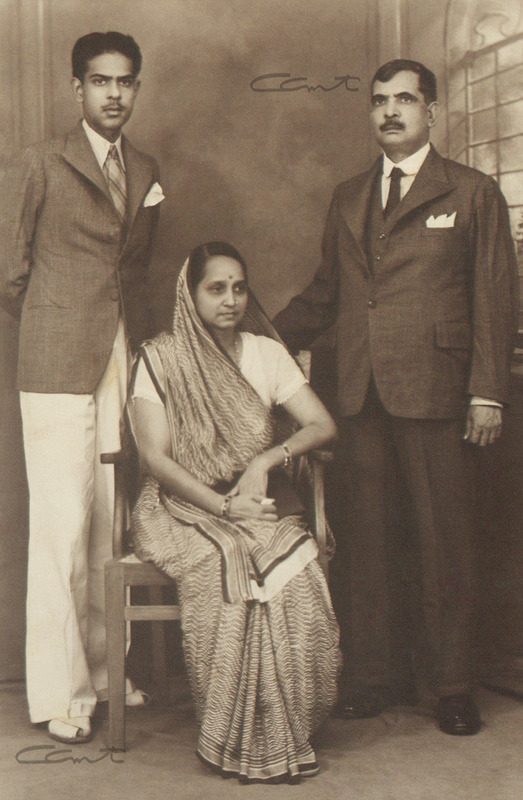 Narendra Shroff seen here with his parents, was a close friend of Balakrishnan Menon. Narendra Shroff, a bosom friend of Balakrishnan, was studying in Lucknow University. Kuttan Menon knew Narendra’s father and it was through this contact that he learnt about the Lucknow University and decided to send Balakrishnan there. The two young men shared a passion for tennis and became inseparable friends. After college, Narendra returned to Delhi and got married. Around this time Balakrishnan got involved with the freedom movement. After this break, they met each other in Delhi and continued their friendship. By this time, in date 1944, a son was born to Narendra. Within a year, Narendra came down with a paralytic stroke. Balan treated him like his own brother and often stayed with him to massage him and help him with his physical needs. Slowly his condition deteriorated and he passed away in 1947. This was a great shock to Balan and the world came crumbling down around his shoulders. Balan had already visited Sivananda Ashram in Rishikesh as a journalist in 1946. Gradually, his visits became more frequent and he stayed in the ashram from July to October 1946. Shroff’s death became a catalyst. The balance tilted and Balan moved over to the ashram and the spiritual way of life for good.